evaluation of radon situation and radioactive contamination of foodstuff. display of current measurement units and a blinking symbol of the radiation intensity; alarm discharge of batteries. Dosimeter-radiometer MKC-01СА1B allows to perform a quick search of contaminated objects or radioactive radiation sources, as well as monitor the human habitat (radiation safety of working places, habitation, locality; assessment of radioactive contamination of real objects, foodstuffs, materials and samples; evaluation of radon situation in inhabited and working premises, etc). 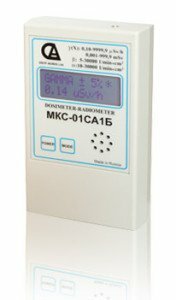 Voice reproduction and operational voice analysis of the results of the assessment of the radiation situation allow to increase significantly the ease of use of the MKC-01СА1B, as communities, as well as employees of different services.